Closed in November due to over popularity, the New Shunt Lounge opening on Thursday night is not so much a change of location* as a change of focus. Returning to the collective's roots, this will be a more relaxed members' bar than in the frantic days when you had to queue right through the station, with proposed events featuring experimental installations which capitalise on the fantastic vaults and - as anyone who's been to Money will testify - their trademark audience interaction. Locally sourced drinks, more sofas and "the odd pole-vaulter" are promised alongside a series of film making and photography workshops, circus acts, theatre, installations and performances. They've also taken over a new area of the vaults to create The Airplane Cinema, where you can recline on salvaged jet seats. In the first week, Musion Holograms present a new installation, 'Holographics are Serendipity'. 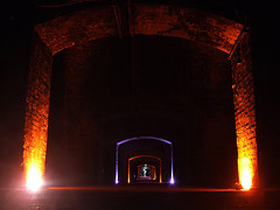 More commonly used by acts like Madonna and Gorillaz in stadium shows, Shunt has created an academy whereby a new vein of artistic talent can experiment with this high-end technology, interacting with musicians and artists within the space. The first Shunt collaborations to come out of this will be the intriguingly titled Kinga A. Malisz's Ghost Metamorphosis (Part I), Laura Jane Healey's Smoke & Mirrors and Madi Boyd & Mat Hourteillan's MADink. New Opera Hero - a six song, multimedia event by Steff Ungerer & Michael Wilson - and Marcelo dos Santos & FanSHEN Theatre's Moshing (Part I of Moshing Lying Down) will also be joined on Friday 14th with the first string orchestra to take over the space. Open Thursdays 6pm-1am, Fridays and Saturdays 8pm-3am. Day membership available here for £10 in advance, although a limited number of passes will be available on the door each night. *In fact, it's not a change of location at all. It'll be the same old, slightly difficult to find door on Joiner Street. Although this time round there's no ID required - this is an arts venue, not an airline after all.